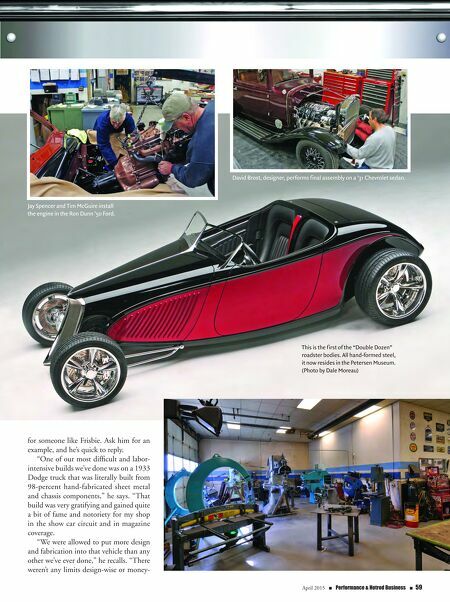 58 n Performance & Hotrod Business n April 2015 HOTROD customs. 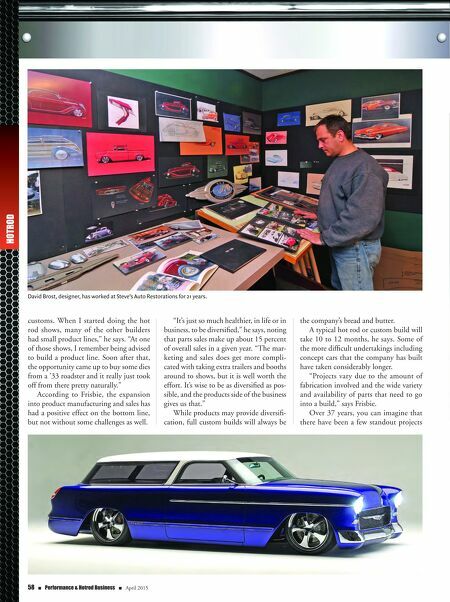 When I started doing the hot rod shows, many of the other builders had small product lines," he says. "At one of those shows, I remember being advised to build a product line. Soon after that, the opportunity came up to buy some dies from a '33 roadster and it really just took off from there pretty naturally." According to Frisbie, the expansion into product manufacturing and sales has had a positive effect on the bottom line, but not without some challenges as well. "It's just so much healthier, in life or in business, to be diversified," he says, noting that parts sales make up about 15 percent of overall sales in a given year. "The mar- keting and sales does get more compli- cated with taking extra trailers and booths around to shows, but it is well worth the effort. It's wise to be as diversified as pos- sible, and the products side of the business gives us that." While products may provide diversifi- cation, full custom builds will always be the company's bread and butter. A typical hot rod or custom build will take 10 to 12 months, he says. Some of the more difficult undertakings including concept cars that the company has built have taken considerably longer. "Projects vary due to the amount of fabrication involved and the wide variety and availability of parts that need to go into a build," says Frisbie. Over 37 years, you can imagine that there have been a few standout projects David Brost, designer, has worked at Steve's Auto Restorations for 21 years.